I love it when you find some little curiosity in your own city that you’d never known about. 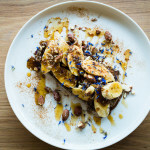 It’s hard not to be a grumpy know-all when you’ve lived somewhere forever, but these chance moments make you realise there are thousands of wonderful things you could discover, if you just wriggle out of your set-shell routine for a while. And that’s how I felt when I chanced upon The Tea Centre the other day. 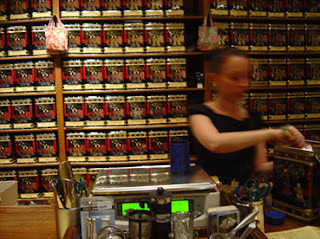 I was on a tea mission – the plan was to buy a zippy, tastebud-tingling tea as a gift for someone. I looked up the newspaper archive at work and the first entry that floated to the top was The Tea Centre. With over 185 kinds of brews to spoon into your pot, it makes you want to start a national recall of the dishwater teabags that plague meetings everywhere. I must admit, before I ventured into The Tea Centre, I didn’t know what to expect. The store is located in ‘The Glasshouse’, a part of Pitt St Mall that I can say I have never stepped into. (This makes me sound like a real bumpkin, but the area truly isn’t a drawcard part of the mall. And like most people, my mall-haunting days spiked in my teens and rapidly bottomed out after that.) Luckily, it turns out the shop isn’t one of those bland carbon-copy shopfronts that are the same the world over. 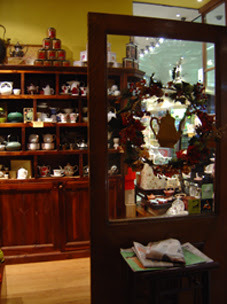 In fact, the boutique window display alone is filled with bowls of tea leaves and cute teapots aplenty. Its instant charm reminds me of the wonderful stores you find – not by map, but by pure surprise – when you’re on holiday. 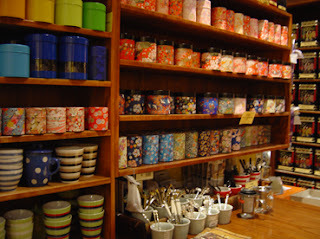 Inside, there are rows of Japanese-style tins and boxes with Art Noveau-style prints. 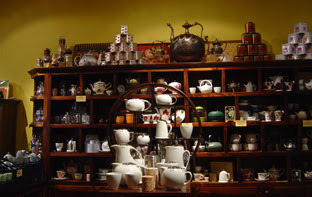 The store has lots of character and there is much whimsical tea paraphernalia on display (including a strainer shaped like a house – it has the word ‘tea’ imprinted on its roof). Should you feel like sipping a steaming brew, you can sit down with a cuppa in the cafe and nibble on blueberry cheesecakes and carrot and almond cake. The menu also includes soup every day. I couldn’t decide which tea to get – I was brew-overwhelmed. The list of strainable choices vary from smoky Russian Caravan to Japanese Cherry to Amaretto to Earl Grey Blue Flowers. The store also sells the super-hard-to-find maccha green tea powder, which is the crucial ingredient for making green tea ice cream. Geographically, these tea leaves spell out the drinking habits of everyone from Sweden to Kenya, England to Indonesia. 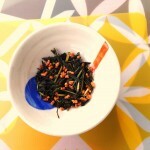 From a more local cup, you can select from an Australian Daintree black tea and the Sydney Special Blend (a black and green tea with mango, jasmine flowers, rose flowers and sunflower blossoms that my friend Tabitha is super-acquainted with – it’s a popular dinner party pick, it seems). I was after a herbal tea that was a little zingy and adventurous, but not wild and weird (this is tea after all). This ruled out the Country Lavender (a black tea with lavender blossoms and Cat’s paw that only brings to mind my friend Chris’ observation that anything with lavender has an unpalatable “grandma” taste – leave it for fairytale wolves, I suppose). To help me out, the assistant suggested the Rooibos Fireside – a Rooibos tea with orange peel, cinnamon and cloves. She held the box up to my nose and the fragrant hit (homey cinnamon with a citrus twist) won me over straight away. After it was scooped into a stylish tin, I felt well-accomplished. Mission completed – and without a wired-up Tom Cruise character in sight. 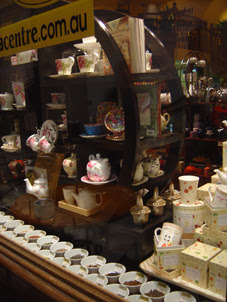 The Tea Centre, 146 Pitt Street Mall, Sydney NSW, (02) 9223 9909, www.theteacentre.com.au. 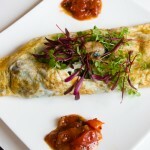 Open Monday to Saturday. I keep meaning to go there to compare it to T2 and Rosa Tea House (World Square) but on my first attempt I misremembered the address as Skygarden, not Glasshouse. On my second attempt I was supposed to drop in before a gig in the city but was late out of the blocks so it was closed. 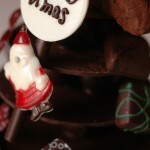 Will need to make a more concerted effort in time for Christmas! Nothing better than fresh home grown tea. 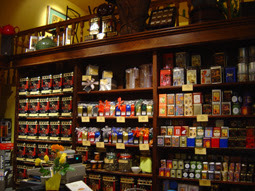 The Tea House and Rosa Tea House sell tea that is far superior in quality to T2. Just smell it – your nose will tell you before you even taste it. There is no comparison. The people behind the counter really know their stuff too. You will never go back to tea bags if you get into the habit of drinking good tea. It’s the same as comparing instant coffee to the best quality coffee from places like Toby’s Estate, Campos etc. 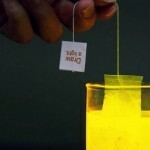 The tea in teabags is chaff!! !